We’ve listened to many businesses share what’s important to them in building and growing a healthy business. What we’ve found is that businesses are looking for a low-cost, reliable, and secure messaging and collaboration solution that supports their business rather than challenges it. If your business finds itself identifying with some of these challenges, then you might be interested in considering the Google Apps solution for your business. Dramatically lowers your total cost of ownership. No hidden maintenance or upgrade expenses – since Google hosts your data, we absorb those costs so that you don’t have to. Access anywhere, anytime you have an internet connection – whether on your mobile device, laptop, or computer in a multi-OS environment (PC, Mac, Linux). Google Apps is a web-based hosted solution, which means you can access Google Apps at anytime, anywhere you have an Internet connection. You might hear this type of technology referred to as "software-as-a-service" or "cloud computing". "Cloud computing" or "software-as-a-service" is a computing model in which IT applications are provided "as a service’, allowing users to access these applications from the Internet ("in the cloud") without needing to maintain the infrastructure that supports them. A simple way to understand the model is how people currently allow companies to run and manage their electricity rather than generating it within their home/office themselves. Google launched Google Apps for Business in February 2007, and we have seen an incredible rate of market adoption, including more than 4 million businesses. We are signing up over 5,000 businesses per day on the Google Apps platform. And let’s not forget that Google Inc. itself is running its company of 20,000+ employees on Google Apps. 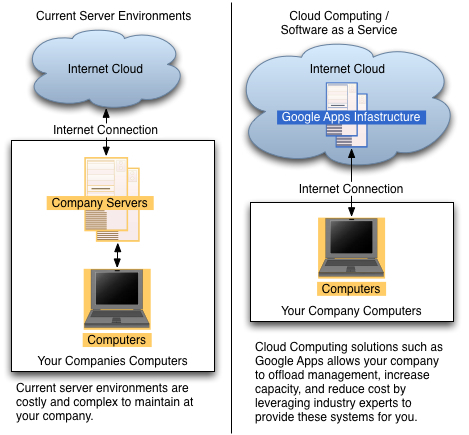 Lower cost: Google delivers Google Apps to your business over the Web at a fraction of the cost of installed systems. This means that Google Apps can provide a significantly lower total cost of ownership (TCO). Mailbox redundancy, infrastructure upgrades and infrastructure scaling are all handled behind the scenes by Google, so your business doesn’t need to budget time and money for these projects. Improved usability: Google Apps provides the simple, intuitive interface so that there’s minimal training resources involved for end-users. To help your business make the switch to Google Apps easier, we’ve enabled a smooth IMAP migration from other platforms to Google Apps; this allows administrators to migrate a handful or a few thousand user mailboxes from an existing mail system to corresponding Google Apps mail accounts. We currently support migration from Microsoft® Exchange Server 2003, Cyrus IMAP Server, Courier-IMAP, and Dovecot via the IMAP protocol. IMAP migration is only available in Google Apps for Business. If you currently run one of the supported legacy systems, you can get more details in our IMAP migration overview. Our Google Apps solution for businesses is a packaged product of Google’s best messaging and collaboration applications, among which include Gmail™, Google Talk, Google Calendar, Google Docs, Google Sites, and Google Video. Both scenarios are definitely possible with Google Apps. Google Apps for Business generally provides the flexibility to do whatever you need to do with your email, it’s just a question of how much configuration you have to do on your end for your specific business needs. Once everything is in place, and incoming/outgoing email is being captured in Google Apps, you will be able to move over seamlessly to Google Apps should the need arise. We think that as you come to be comfortable with the cost, reliability, and convenience of Google-hosted email, you and your users will be able to transition over to Google Apps as a complete solution. 1. You can use the SSO API to sync users’ names and passwords when a user sets them on your system. While this will not keep your users’ passwords exactly in sync, it does allow our system to have the same password as your sso. This also allows for increased access to our system beyond the web interface. 2. Google Apps’ SAML 2.0-based SSO integration allows you to hold all your users’ accounts and passwords without the need for Google Apps to hold any user passwords. Google Apps is accessible from a variety of mobile phones, including BlackBerry devices, the iPhone, Windows Mobile and many less powerful mobile phones. We offer multiple syncing capabilities so that you can access your Google Apps account when you’re on the go. Google Apps does not support Google Apps and Google Apps for Business user accounts as part of the same organization’s Google Apps account.